This article is about the current European Parliament Group. For the europarty established in 1992, see Party of European Socialists. "S&D" redirects here. For other uses, see S&D (disambiguation). The Progressive Alliance of Socialists and Democrats (S&D) is the political group in the European Parliament of the Party of European Socialists (PES). The Progressive Alliance of Socialists and Democrats was officially founded as a Socialist Group on 29 June 1953 which makes it the second oldest political group in the European Parliament after ALDE. It adopted its present-day name on 23 June 2009. Centre-left in orientation, the group mostly comprises social-democratic parties and is affiliated with the Progressive Alliance. Until the 1999 European Parliament elections, it was the largest group in the Parliament, but since those elections it has constantly been the second-largest group. During the 8th EU Parliament Assembly, the S&D is the only Parliament group with representation from all 28 EU member states. In the European Council, 8 out of 28 Heads of State and Government belong to the S&D Group and in the European Commission, 8 out of 28 Commissioners come from PES parties. The Socialist Group was one of the first three groups to be created when it was founded on 23 June 1953 in the Common Assembly of the European Coal and Steel Community. The Common Assembly was the predecessor of the European Parliament. A group bureau and secretariat was established in Luxembourg. The group continued through the creation of the appointed Parliament in 1958 and, when the Parliament became an elected body in 1979 following the first European election, the group became the largest in terms of returned MEPs. It has ever since remained the largest or second largest Group. In 1987, the Single European Act came into force and the group began co-operating with the European People's Party (EPP) to secure the majorities needed under the cooperation procedure. The left–right coalition between the Socialists and EPP has dominated the Parliament since then and (with some exceptions) the post of President of the Parliament has been split between the two groups ever since. Meanwhile, the national parties making up the group were also organising themselves on a European level outside the Parliament, creating the Confederation of Socialist Parties of the European Community in 1974. The Confederation was succeeded by the Party of European Socialists (PES), in 1992. As a result, the parliamentary group was renamed the Group of the Party of European Socialists on 21 April 1993. In 1999, the Parliament refused to approve the Santer Commission's handling of the EU budget. Allegations of corruption centred on two PES Commissioners, Édith Cresson and Manuel Marín. The group initially supported the Commission but later withdrew their support, forcing the Commission to resign. The group was renamed again to the Socialist Group in the European Parliament on 20 July 2004 and was given a different logo, to further distinguish the PES group organisation from the PES European political party. In 2007, the Socialist Group was the second largest group in Parliament, with MEPs from all but two member states, Latvia and Cyprus. However, the 2009 European election saw a reduction in the number of PES MEPs returned from 2004. The group sought additional members in the Democratic Party of Italy, which was not affiliated to the PES in 2009. By the conclusion of the 2004-2009 parliamentary term, the Democratic Party had 8 MEPs in the Socialist Group (coming from Democrats of the Left), but also had 8 MEPs in ALDE Group (coming from The Daisy). The Democratic Party is a big tent centre-left party, strongly influenced by social democracy and the Christian left, and had MEPs who were former Christian Democrats or had other political views. So a new and more inclusive group name had to be found. The group was going to be named Alliance of Socialists and Democrats for Europe (ASDE) but this was seemed too similar to Alliance of Liberals and Democrats for Europe (ALDE). The name Progressive Alliance of Socialists and Democrats was suggested on 18 June by group president Martin Schulz and it was renamed on 23 June 2009. The English abbreviation was initially unclear, being variously reported as PASD, S&D Group or PASDE. Dissatisfaction by Socialist MEPs towards the new name led Martin Schulz to admit that the name was still under consideration and that the group was to be referred to as the 'Socialists and Democrats' until a final title was chosen. On 14 July 2009, the first day of the constitutive session of the 2009-2014 term, the full formal group name was Group of the Progressive Alliance of Socialists and Democrats in the European Parliament and the abbreviation was S&D. The S&D Group joined the Progressive Alliance upon its official foundation on 22 May 2013 and is a member of the organisation's board. The group was formerly an Associated Organisation of the Socialist International. For Presidents of the European Parliament from the group, see President of the European Parliament. The group is led by a President and a Bureau of Vice-Presidents. There is also a Treasurer and a Secretary General. The S&D has MEPs from all 28 EU states, including 25 with more than one MEP (in red) and three with exactly one MEP each (pink). ^ a b c d e "Seats by Political Group in Each Member State - Elections, Politics & Social Issues". elections2009-results.eu. ^ a b c "Democracy in the European Parliament" (PDF). Retrieved 18 June 2010. ^ a b c d e f g h i j k l "PES on Europe Politique". Europe-politique.eu. Retrieved 18 June 2010. ^ a b c d e f g "Confederation of the Socialist Parties of the European Community Collection". Iisg.nl. 7 December 2005. Retrieved 18 June 2010. ^ a b c d e "Political Groups of the European Parliament". Kas.de. Archived from the original on 17 May 2011. Retrieved 18 June 2010. ^ "Sièges par groupe politique dans chaque État membre 14 juillet 2009 à 09:00 CEST". elections2009-results.eu. Archived from the original on 12 June 2009. ^ a b c "Political Groups Annual Accounts 2001-2006". Europarl.europa.eu. Retrieved 18 June 2010. ^ "European Parliament profile of Martin Schulz". Europarl.europa.eu. Retrieved 18 June 2010. ^ "European Parliament profile of Pauline Green". Europarl.europa.eu. Retrieved 18 June 2010. ^ "European Parliament profile of Ernest Glinne". Europarl.europa.eu. Retrieved 18 June 2010. ^ Nordsieck, Wolfram (2015). "European Union". Parties and Elections in Europe. Archived from the original on 8 June 2017. Retrieved 22 September 2018. ^ Marie-Claire Considère-Charondu (2010). "Irish MEPS in an Enlarged Europe". In Christophe Gillissen. Ireland: Looking East. Peter Lang. p. 157. ISBN 978-90-5201-652-8. Retrieved 27 August 2012. ^ Tapio Raunio (2012). "Political Interests: The European Parliament's Party Groups". In John Peterson; Michael Shackleton. The Institutions of the European Union. Oxford University Press. p. 340. ISBN 978-0-19-957498-8. Retrieved 7 August 2013. ^ a b "European socialists change name to accommodate Italian lawmakers". monstersandcritics.com. ^ Andreas Staab (2011). The European Union Explained, Second Edition: Institutions, Actors, Global Impact. Indiana University Press. p. 67. ISBN 978-0-253-00164-1. Retrieved 5 August 2013. ^ "Organisation - History - The Socialist Group in The European Parliament". Europa (web portal). Archived from the original on 1 November 2007. Retrieved 2 April 2009. ^ "EPP-ED Chronology - 1981-1990". EPP-ED Group website. Retrieved 7 November 2007. ^ Settembri, Pierpaolo (2 February 2007). "Is the European Parliament competitive or consensual ... "and why bother"?" (PDF). Federal Trust. Retrieved 7 October 2007. ^ "Interview: Graham Watson, leader of group of Liberal Democrat MEPs". Euractiv. 15 June 2004. Retrieved 1 November 2007. ^ Ringer, Nils F. (February 2003). "The Santer Commission Resignation Crisis" (PDF). University of Pittsburgh. Retrieved 7 October 2007. 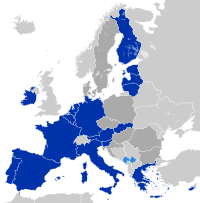 ^ "MEPs by Member State and political group – sixth parliamentary term". Europa (web portal). Retrieved 7 November 2007. ^ Taylor, Simon. "New alliance emerges in European Parliament | Policies | EU governance | Parliament". European Voice. Retrieved 18 June 2010. ^ "Franceschini, Ok Alleanza Socialisti e Democratici". Archived from the original on 18 June 2009. Retrieved 4 February 2016. ^ "Italiani All'Estero - Parlamento Europeo - Il Pd Nell'Asde (Alleanza Dei Socialisti E Dei Democratici). Il Cammino E' Cominciato Anche In Europa"/ News/ Italian Network". Italiannetwork.it. Retrieved 18 June 2010. ^ Julien Frisch (17 June 2009). "Julien Frisch: PES not to become ASDE?". Julienfrisch.blogspot.com. Retrieved 18 June 2010. ^ "Schulz: «Sì dei socialisti europei al gruppo parlamentare Pse-Pd". Il Sole 24 ORE. Retrieved 18 June 2010. ^ "PES looks to the PASD". VoxEurop.eu. Retrieved 18 February 2019. ^ "News - Group of the Progressive Alliance of Socialists & Democrats in the European Parliament". Socialistgroup.eu:80. 22 January 2009. Retrieved 18 June 2010. ^ "Euro MPs build new alliances". BBC News. 2 July 2009. Retrieved 18 June 2010. ^ "European Parliament groups elect their leaders". Euractiv.com. Retrieved 18 February 2019. ^ "Socialists bid to grab key Commission portfolios | EU - European Information on EU Treaty & Institutions". EurActiv.com. Retrieved 18 June 2010. ^ "S&D Group joins new Progressive Alliance – 'the network of progressive forces for the 21st century'". 22 May 2013. Retrieved 18 February 2019. ^ "Progressive Alliance Board" (PDF). ^ Progressive Politics For A Fairer World. Socialist International. Retrieved on 24 August 2013. ^ a b c d e f g h i j k "Presentation". Socialist Group website. Archived from the original on 1 November 2007. Retrieved 7 November 2007. ^ "History". Socialist Group website. Archived from the original on 1 November 2007. Retrieved 11 November 2007. ^ "Archiv der sozialen Demokratie". www.fes.de. ^ "News - Group of the Progressive Alliance of Socialists & Democrats in the European Parliament". Socialistgroup.eu:80. 15 December 2016. Retrieved 25 January 2017. ^ "News - Group of the Progressive Alliance of Socialists & Democrats in the European Parliament". Socialistgroup.eu:80. 25 June 2014. Retrieved 2 July 2014. ^ "News - Group of the Progressive Alliance of Socialists & Democrats in the European Parliament". Socialistgroup.eu:80. 24 June 2009. Archived from the original on 16 July 2011. Retrieved 18 June 2010. ^ "PES Members". PES website. Archived from the original on 20 October 2007. Retrieved 7 November 2007. ^ On 14 October 2007 the Democrats of the Left merged with Democracy is Freedom – The Daisy to form the Democratic Party. A minority of Democrats of the Left MEPs did not join the Democratic Party and sat in the PES group affiliated with Democratic Left. ^ The party became the Italian Socialist Party in October 2007. The Italian Socialist Party had 4 MEPs for the remainder of the 2004-2009, the additional two from Socialists United for Europe, formerly Non-Inscrits. Wikimedia Commons has media related to Progressive Alliance of Socialists and Democrats. This page was last edited on 17 April 2019, at 11:23 (UTC).